Iman Wicked and Stila Diamond Lil: Are they Dupes? If you've been a beauty lover for as long as I have, you'll probably have an opinion on dupes - you know, two eyeshadows that are supposed to be exactly alike, or two nail polishes that are exactly alike. Some people love them, because they allow them to get unique colours at cheaper prices, but some others don't buy into the concept, maintaining that true dupes are hard to find, and skintone dependant. As for me, I'm somewhere in between - but as a makeup lover, hoarder, and compusive addict, I can tell you that it's increasingly harder for companies to produce something truly unique. Often a 100% exact dupe is hard to come by, of course, but you get pretty close colours most of the time, and for much cheaper. 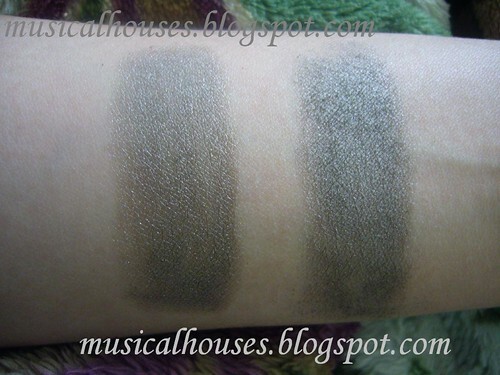 Case in point is today's comparison swatch post: Stila, who has acheived fame for their cult eyeshadows, and the much humbler Iman, which is only found in drugstores in the USA. Stila's Diamond Lil, the much acclaimed (and according to some, superior) dupe to MAC's discontinued Smoke and Diamonds, with a softer texture, is pitted against Iman's Luxury Eye Definint Powder in Wicked. There are differences between the two from the outset. For one, the Iman is a loose eyeshadow, while the Stila is pressed. (I know that alone is going to help some of you ladies out there make your decision already!) And for another, the Iman is a lot cheaper. But of course, dupes are all about colour and quality. So colour-wise, how did they fare? And because I'm all about gratituous photo-taking, here's another shot. So they're not 100% dupes, and if you are a true taupe lover (like yours truly), then you will NEED and absolutely MUST have both. But for the rest of us on a budget or who are just 'meh' about taupes, how do you choose between the two? Well, the Iman's Wicked is definitely less green than Stila's Diamond Lil, and as the photos show, it's a lot more brown. So a big factor colour-wise would be how brown or green your want your taupes to lean. It is in my experience that colours like these tend to pull greenish on warm-toned ladies, so if you're warm-toned, and you don't want too much of a green tinge to your taupe, go for the Iman. If you're cool-toned, you can essentially take your pick of the two since they're both pretty neutral anyway, but if you're so cool-toned that most browns look orangey on you, it might be better to head for the Stila. The Stila's also more frosty than the Iman, so for people who don't like frosty eyeshadows, the Iman might be a better bet. Quality-wise, though, how did the two compare? I really like the Stila for its awesome blendability, and it has it's place of honour in my special Stila 6-pan palette reserved for my favourite Stilas (which also include Cloud and Rain...Ahhhh), and it does stay on all day, with minimal creasing. The Iman is a little trickier to use as it's in loose powder form, and goodness knows how clumsy I am, but it has pretty good pigmentation - I was impressed - and good lasting power too. And one last thing to note, which is sheerness vs opacity. The Stila is sheerer than the Iman, sort of, kind of, in a way. Well, it isn't sheer per se, but it's more buildable. Because of how most Stila shadows are formulated, in my experience they tend to start off sheer but are very beautifully buidable to full opacity, kind of like Chantecaille. And Diamond Lil does the same thing. 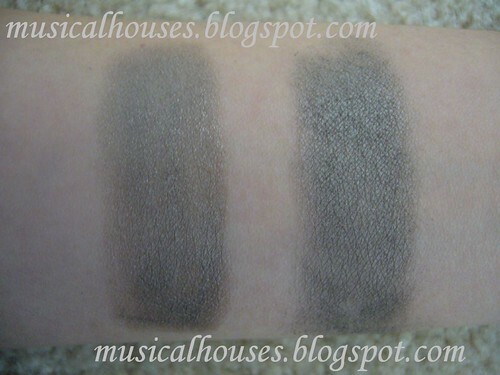 It's a little sheer at the very first brushstroke, but it definitely builds up well (as you can see from my swatches). The Iman gives off more pigment at first stroke. Of course, pigmentation is also a very personal preference, so if you prefer sheerer eyeshadows, go for the Stila. If you want greater opacity, the Iman might be better. The difference in opacity isn't very great though - I'm kind of splitting hairs for the sake of this comparison post. As I always do when it comes to great taupes. I swear that my 2342353 taupes are all different from each other. Really! And that's it for today! I hope you guys have liked this comparison! i think they defo look like the same product. I think the Iman shadow has so much more gold and warmth than the Stila! Both beautiful though, but they are definitely different to my eye.